New Your bed, couch, or favorite reading chair can now double as a workspace (workstation). Our LEVO Rolling Laptop Workstation extends over your furniture so you can sit comfortably all the way back in your chair, sofa, or bed. 5 freely moving adjustments give you the freedom to work in any position you want. Sit, stand or lay down. Our LEVO Laptop stand gives you the option to do all three. Cantilever design extends your laptop over you so you can sit all the way back in your chair, not just on its edge. 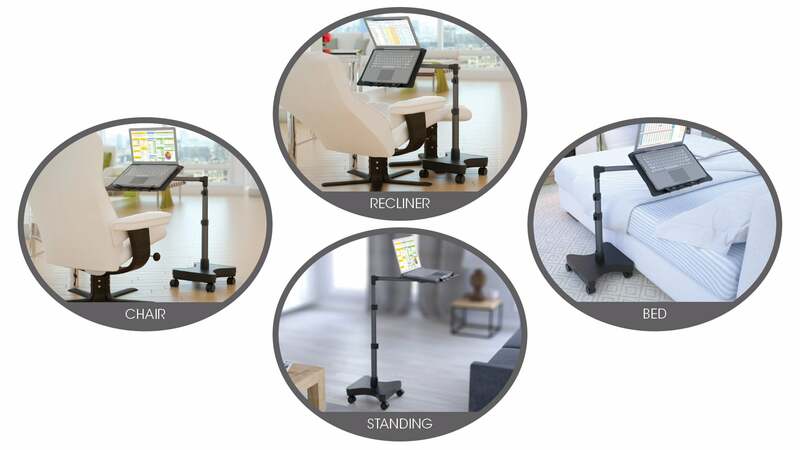 People love the features of our LEVO Tablet and Book Stands so much - we now bring you those amazing features - and much more - our LEVO Rolling Laptop Workstation Stand allows you to swing and tilt your laptop into the perfect position! Feel the freedom of bringing your laptop to your favorite spot in the house or office, and work comfortably - whether you are sitting, standing, or laying down. Imagine your laptop extended over your lap while you sit comfortably in your favorite chair or recline in your bed. It can be a reality! The LEVO Rolling Laptop Workstation Stand’s height and horizontal adjustments perfectly position your laptop so you can sit, relax, laptop and chill. 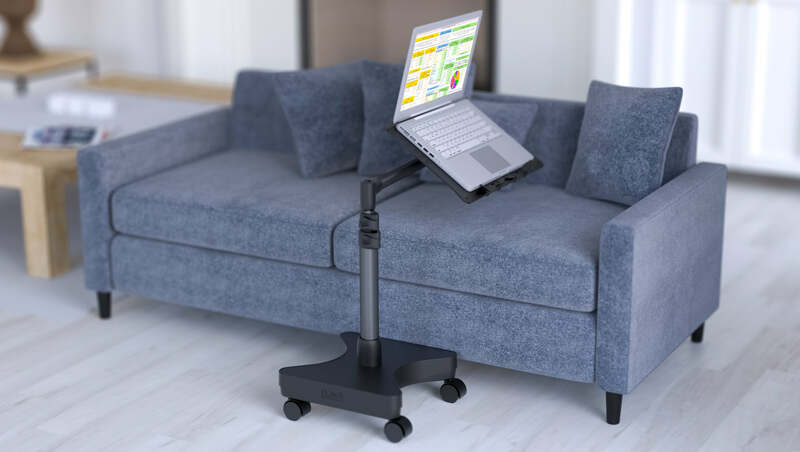 This LEVO Rolling Laptop Workstation Stand has sturdy casters so that you can roll it around your home or office, and a weighted base so that you can securely move the stand about with your laptop. The hourglass-shaped base is both attractive and maneuverable around furniture. Tired of sitting slouched over your desk all day? This LEVO Rolling Laptop Workstation Stand quick lever height locks allows it to be easily adjusted from sitting to standing. Trying working from a new perspective - and think how impressed your chiropractor will be! 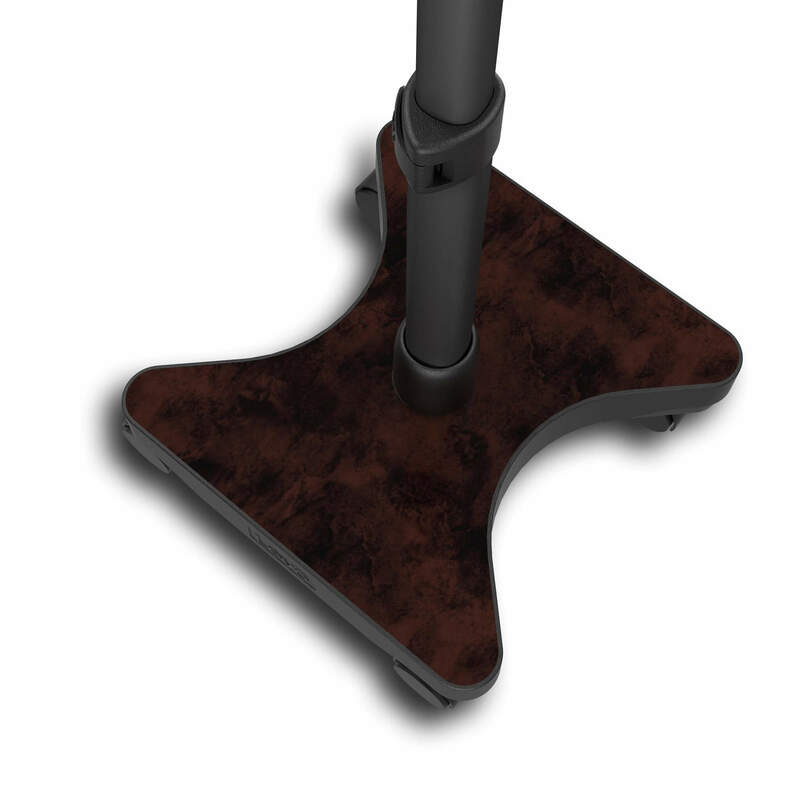 The base of our LEVO Rolling Laptop Workstation Stand is shaped like an hourglass to hug the furniture. This allows you to roll it close to the furniture, without being in the way. Another way to position your LEVO Rolling Laptop Workstation Stand is directly in front of your chair. The base makes a nice foot rest. Plus, you can control the position of your laptop with your feet - really, give it a try. Our custom graphic Skins add personality and style to your LEVO Rolling Laptop Workstation Stand. Each is printed on a high quality polymer for rich color. Removable adhesive allows you to change your LEVO’s look at anytime. 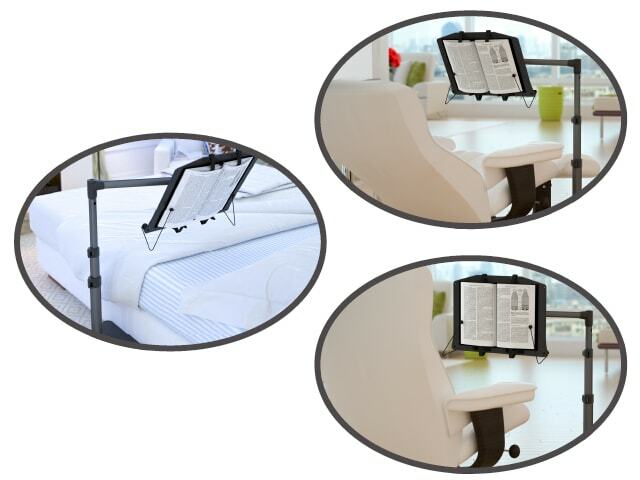 With the addition of our LEVO Book Kit, your LEVO Laptop Workstation Stand will easily transition to a book holder. See it here. 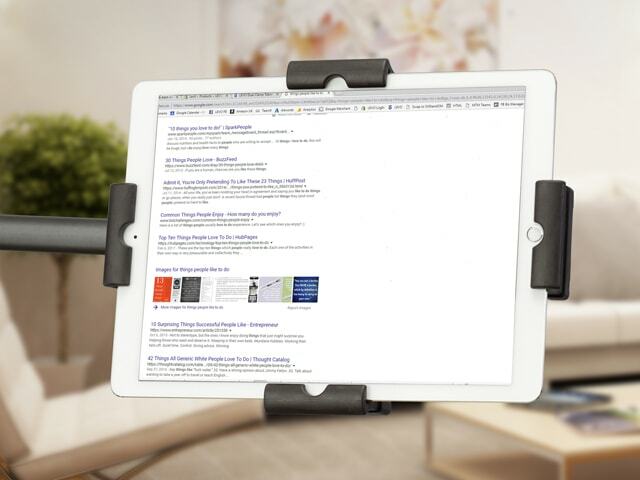 You can use this LEVO Rolling Laptop Workstation Stand, as is to hold your tablet, but for more secure tablet holding and inverted use, you can add our LEVO Dual Clamp Tablet Cradle for any size tablet. 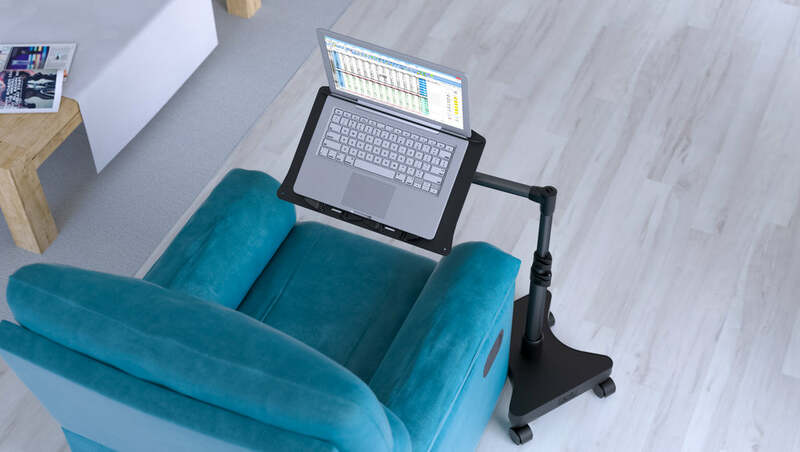 The platform for the LEVO laptop stand and the tablet cradle are interchangeable, so you can swap your laptop platform out for your tablet cradle whenever you want. See it here. Is there anything available to hold an external mouse on the side? We are currently working on an accessory to use and store an external mouse. We will send you an email once they are ready. Could this also be used as a sort of portable desk for writing on? Hi. Yes. Our LEVO Workstation can be used as a portable writing desk. It's great for writing, sketching, and more. The top surface of LEVO's Platform has a texture, so you'll need to add a smooth material beneath your paper. Great question. Our LEVO Rolling Laptop Workstation can hold up to 8 pounds. 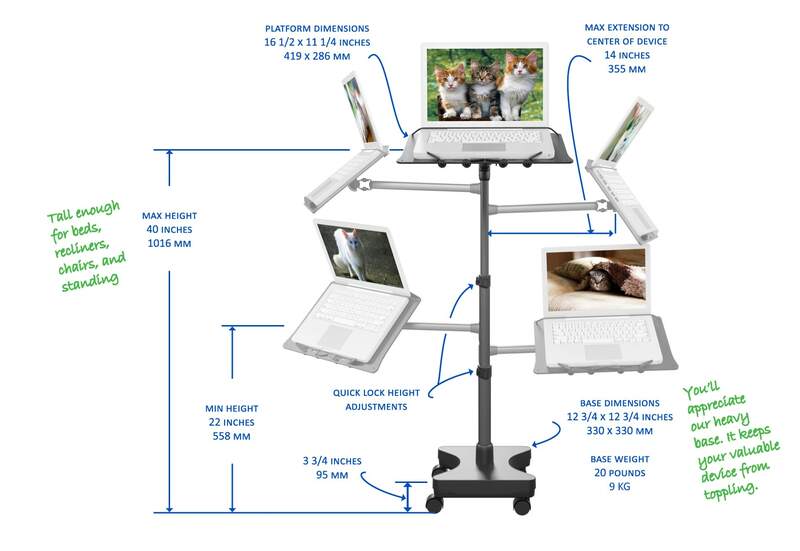 The laptop holder on the LEVO Rolling Laptop Workstation Stand is not compatible with the LEVO G2 Deluxe Tablet Floor Stand because the tablet stand has a longer horizontal extension that adds more leverage. With the weight of a Laptop, the stand could tip. 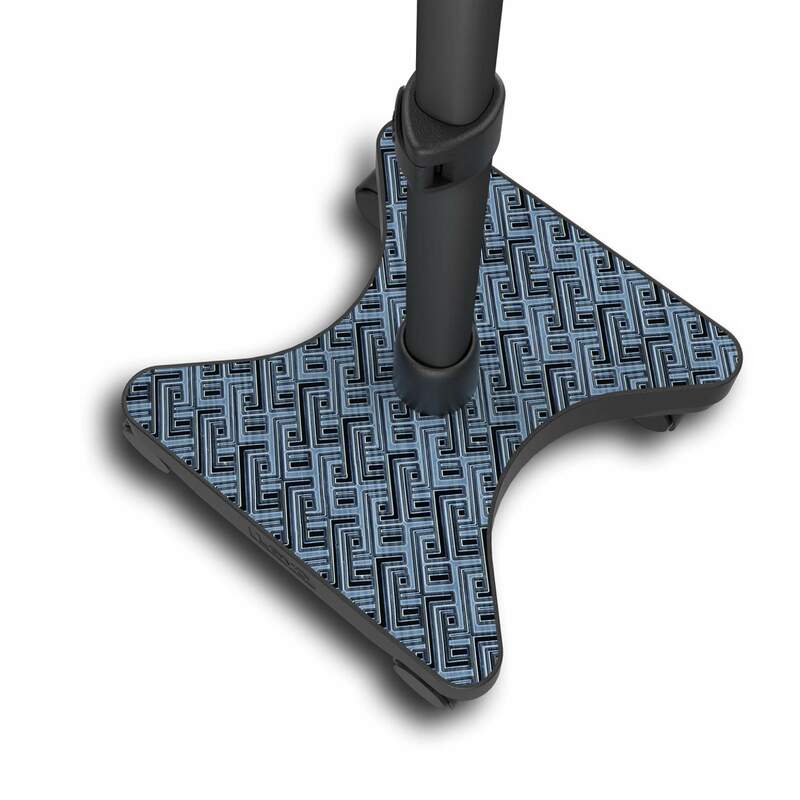 To remove the clamping ends of the Dual Clamping Tablet Cradle, hold the arm of the cradle in one hand then wiggle and pull the clamping end towards the center. It will release. 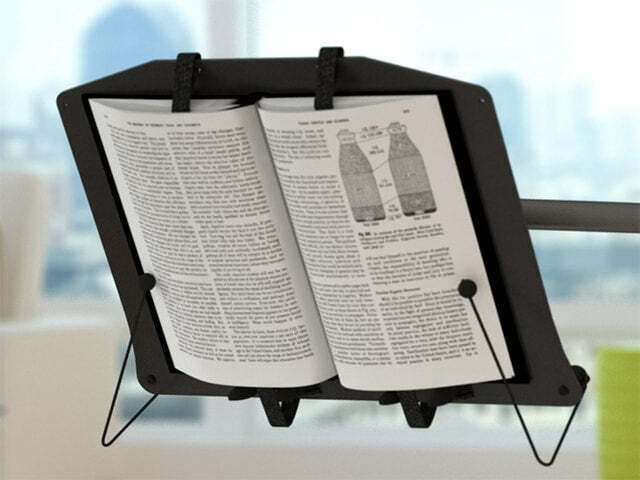 I had a Levō iPad holder with the bungee platform for several years. I was looking for extra bungees when I came across the Levō laptop roller. 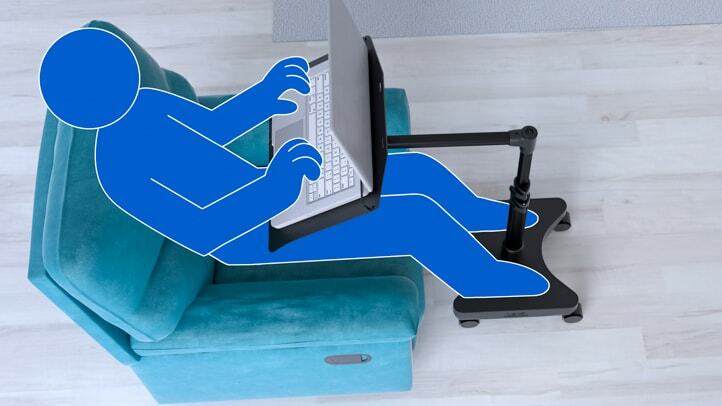 I was using another laptop holder for my office and was always thinking that there has to be something different out there, because it was bouncy, awkward to maneuver, and the arm length was not enough. When I saw the laptop roller, I remember thinking, “Finally!” I am very happy with this purchase and based on my experience with the iPad holder, I anticipate that this is the last laptop holder I will need for my office. Thank you for making this. I am so pleased with my laptop stand. 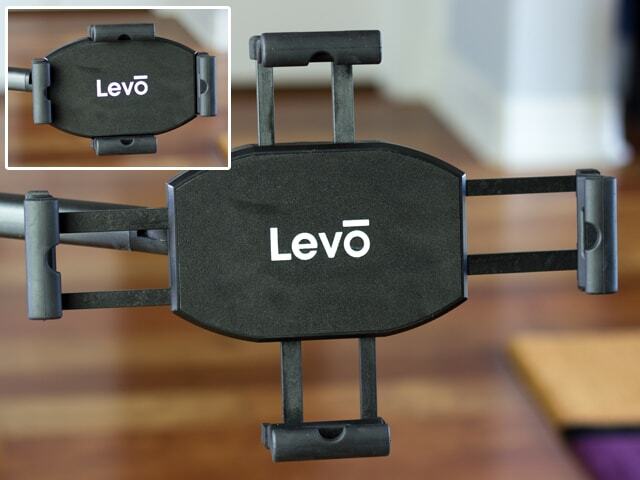 This is my 3rd Levo product (I also own the G1 tablet stand and G1 tablet table clamp), and the products are of great quality and solid design. 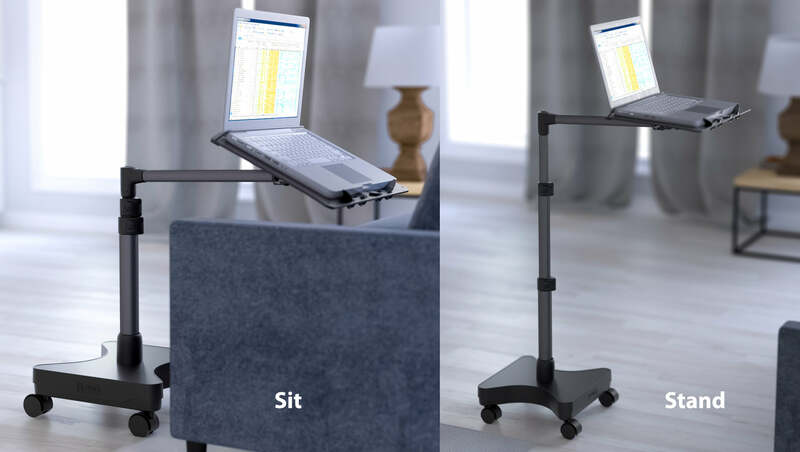 The laptop stand is useful for me as an older person with bad knees because it is very uncomfortable to sit at a desk for long periods of time. The hourglass shape of the base helps it hug the legs on my arm chair so it sits as close to me as possible. You can certainly feel confident that your laptop is secure when using this product. Keep up the good innovative work, I cannot wait to purchase the upcoming mouse attachment. Great for working on the laptop in bed. I recently had a back problem (herniated disk) which prevents me from sitting for a prolonged period of time. 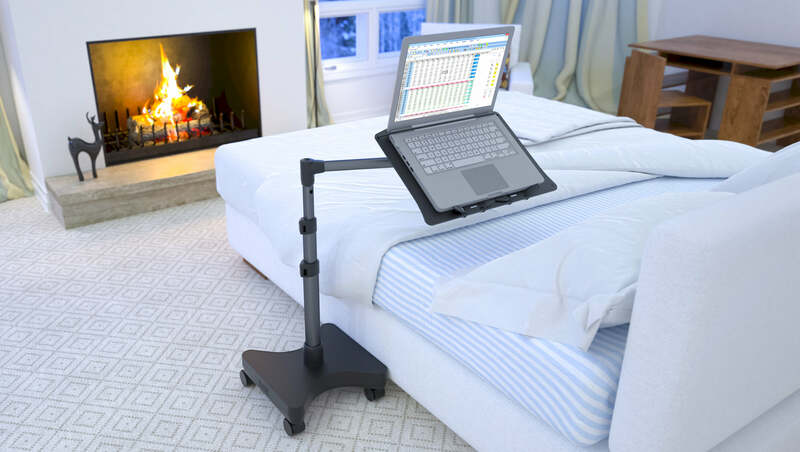 My condition prompted me to look for a laptop stand that would help me work on the laptop while lying in bed. At the time I bought this, there was no available review yet so I don't really know what to expect. Although quite pricey, I ordered this hoping that this will help me solve my problem. I was not disappointed! The base is heavy but easy to roll. I could easily move this anywhere in my bedroom. The laptop holder can also be tilted to find the best position for the laptop. I only have 2 minor issues with the laptop stand: (1) due to the weight of my 15" laptop (Dell XPS 9550), the topmost section of the post would very slowly slide down. I know this is not a big problem since I think there's a way to tighten the lock although I haven't tried it yet, and (2) the elastic cord that is used to secure the laptop to the holder is a little short. It measures 12". I think it was meant to be short so it will secure the laptop tightly but in my case it's too tight to attach and remove. I'm afraid that if I stretch it too much and my hold slips, it might hit me back. I'm also afraid that it might damage the hinge of the laptop as it sits tightly on the laptop hinge. I wish they had made it longer (I would prefer a 16" cord) or maybe provide us with elastic cords of varying lengths (12", 14" and 16"). These minor issues aside, this laptop stand had served its purpose and I wouldn't hesitate to recommend it to my friends and relatives. By the way, I also bought the Levo dual clamp tablet holder and it easily attaches to this laptop stand (you would have to remove the laptop holder first). The dual clamp holder holds my ipad pro 10.5" securely and now I can surf the web and watch movies and youtube videos while lying in bed. Overall a great product! I bought the G2 Tablet stand as a birthday present for my busy professional sister a couple of years ago. She loved it and so did her husband who began using it regularly. My brother-in-law said that one of his favorite things to do is to use the Levo tablet stand to read online magazines and the newspaper while lounging in the bathtub with a glass of wine. Additional observation of my sister has revealed that she does a lot of laptop work sitting up in bed, along with reading books. 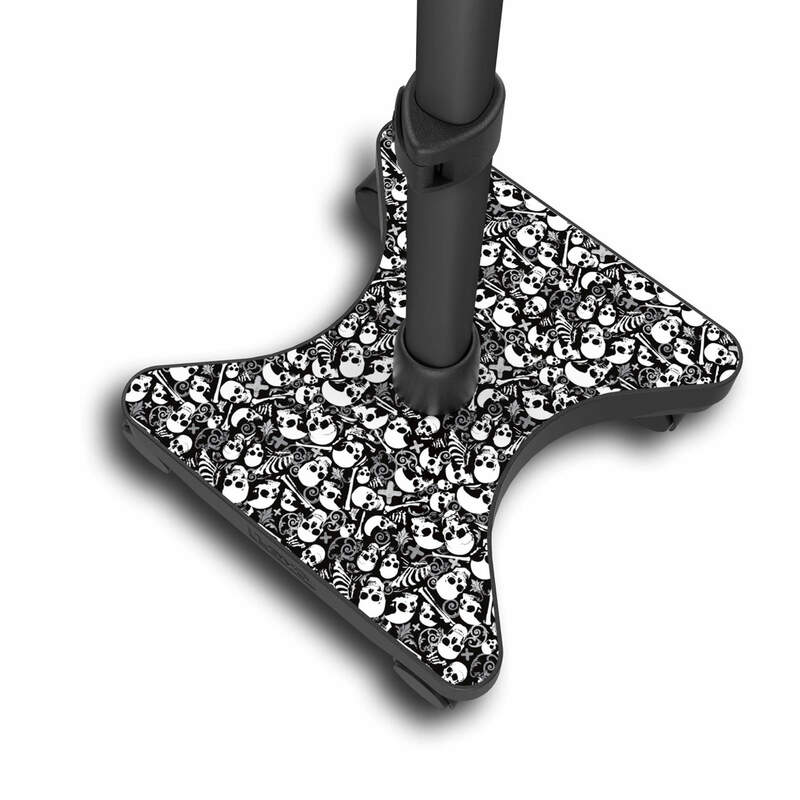 When I saw the new Levo laptop stand I knew that it would be the perfect new Christmas present. I immediately ordered it with the added book kit. In addition, I upgraded the previous tablet stand with the new dual clamp tablet cradle, adding the interchangeable book cradle. Today my brother-in-law called and reported that the new Levos have been assembled, are in use and they feel very happy. Really...I can not wait to see what you next create. Hi. Thanks for being such a fan of LEVO. I’m so glad your sister is putting your gift to good use. What will we work on next? Hmmm…. We have a new LEVO Music Stand in the works. Several musicians are envisioning a LEVO set on the side of their keyboard extending to the center. So, were taking a serious look. This Product is Life changing! I work remotely from home when I am not traveling for work and gave up my home office recently in lieu of a movie room for my family. I am used to working in multiple rooms in my home and found it challenging. I received the rolling laptop work station 6 weeks ago and have to say that it truly changed my remote work life. The flexibility being able to easily roll it between rooms is so nice. The base is very stable and supports my heavy duty laptop. I am able to conduct video conference calls, create presentations and respond to emails easily and efficiently no matter where in the house I choose to work that day. The base is also designed to fit closely against any piece of furniture and I found it very easy to adjust for height. It is also compact enough to tuck away on the weekends in a closet or pantry. I highly recommend this product for anyone who works from home. Your only challenge will be from your kids trying to borrow it from you for homework! Wow. I'm so glad your LEVO is helping you work remotely. Our mission is to enhance your work at home lifestyle. It sounds like we did that for you. Contact us any time.